I’m lucky in my job in that I get to travel around the country and talk with educators who are doing amazing things in their schools and classrooms every day. In talking with them, they all discuss their desire to get even better at this art that is teaching. But oftentimes, they don’t have the support available to help them grow or don’t know how to improve on their own. Luckily, Robert Kaplinsky has a solution: #ObserveMe. In his blog, Robert challenges teachers to embrace the need that all of us have to grow by inviting peers into the classroom to provide feedback. This is not about being evaluated or measured; it’s about asking your colleagues, the ones who teach next to you and who know exactly what you are going through, to help you get better. 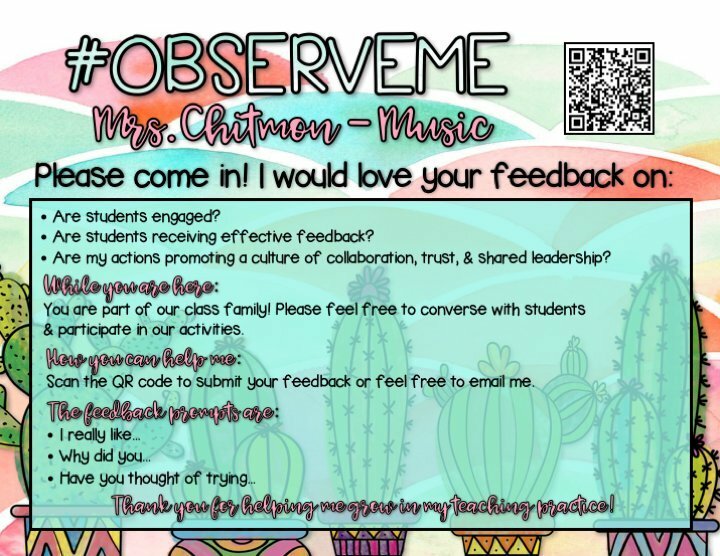 Robert’s blog has now grown into the #ObserveMe movement, and I think it’s a very positive thing for education. Similar to the pineapple chart, #ObserveMe is based on the idea that we learn best from each other while actively on the job. On days when you choose, you post a sign outside your classroom that lets others know that you are asking them to help you grow by coming into your classroom while you are teaching and providing feedback to you on specific, identified needs. Below is the sign that teacher Catelyn Cantrell-Boze posted on her door. Notice that Catelyn has identified three areas in which she feels she can improve and posted questions for her fellow teachers to try and answer, based on her teaching that day. The visiting teacher answers the questions via a Google Form. Here’s another example from Jennifer Chitmon. You can find even more examples here via the #ObserveMe hashtag on Twitter. As you embark on this strategy, you should probably let your campus administrators know what you are trying to do. I know that they will support you in growing professionally. Asking others to come into your classroom and critique what you are doing is definitely daunting. But true growth can’t happen in a vacuum. Your peers and your leaders will admire you for trying to improve, and your students will understand that you care about them and their learning so greatly that you are willing to go out on a limb for them. 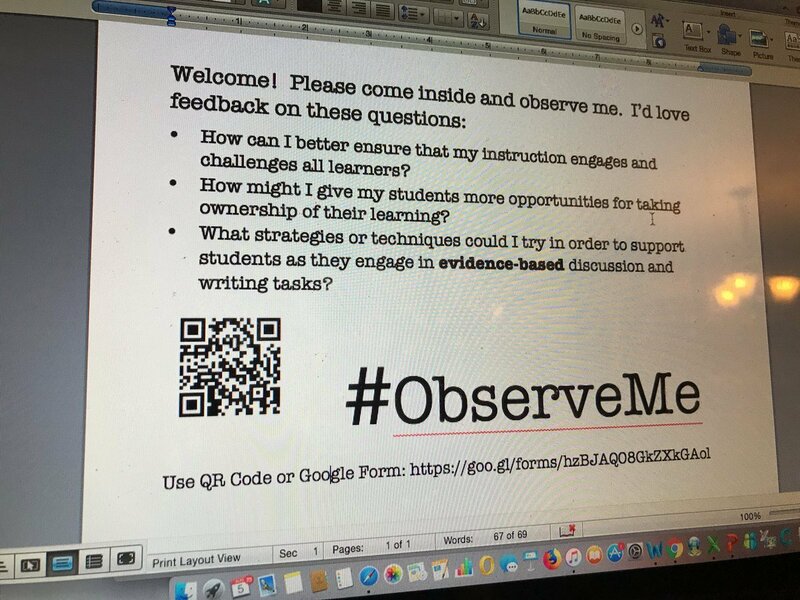 So reflect on what aspects of teaching you want to become better at and post your #ObserveMe sign. Then put on your fearless hat and be ready for the amazing results of opening yourself and your classroom up!